In 1965 I attended Hidden Valley Camp in New York, sponsored by the Herald Tribune Fresh Air Fund, which set out to integrate physically handicapped and able bodied children in the eight to twelve age group. This camp was an outstanding success, and as a result I decided to set out to try to further this kind of work in England. The main people with experience of this work in England were the National Association of Youth Clubs with their Treasure Trove Courses (now called PHAB Courses) for the 15 - 25 age groups, and the Boy Scouts in the London area for their own members at their ‘Agoonaree camps’. The Birmingham Young Volunteers Trust agreed to sponsor an experimental camp on the American lines, provided that finance could be obtained from separate sources. 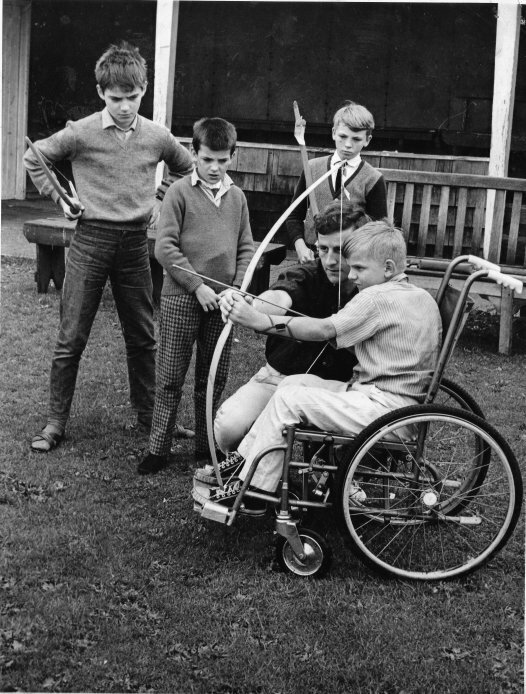 The Trustees of the Lord Mayor Treloar College at Froyle, near Alton, Hampshire, which is a school for physically handicapped boys, gave permission for one of their houses to be rented to enable us to take forty children and about twenty helpers on the camp. The fee of £100 per week included the use of their swimming bath, grounds, and two mini-buses and drivers (apart from petrol and any overtime) we paid approximately 35/- per head per week for food, and paid four/ five catering staff for the 12 day period. The dates fixed for the camp were 31st July to 11th August. A weekend conference was held on l3th-l4th May to discuss plans for the camp. Those present included almost all the volunteers who had offered to help at the camp, including the camp leader, Douglas Stewart. Speakers included Miss Fairhead, Assistant Director of the Midland Branch of the British Red Cross Society, Mr. Mitchell, Headmaster of the Wilson Stuart School for physically handicapped children, and the Lady Jean Mackenzie, Vice-Chairman of the National Association of Youth Clubs. The basic programme for the camp was decided upon, and the volunteers were instructed in the care of the individual types of handicaps. The problem of collecting the necessary finance had been discussed at an early stage, and it was decided to approach a large number of industrial and charitable concerns. The actual final figure was originally put at over £1,000, but it was soon realised after further discussions with the College and with others that this figure could be lowered to about £850. This target was just reached before the camp took place. The recruitment of volunteers was done through the Birmingham Young Volunteers Trust. We were fortunate in finding a good leader for the camp in Mr. Douglas Stewart, a former house father at a spastics home and currently a mature student at Birmingham University. A great deal of the success of the camp depended upon finding someone suitable. We also discovered a State Registered Nurse, Miss Tither, who was prepared to come and help us voluntarily, since it was obviously vital to have a very responsible nurse with us. We also had three Red Cross volunteers and a St. Johns Ambulance nurse to assist her. We took four brothers (three deaf mutes and their able-bodied brother) from the Birmingham Family Service Unit and one girl from Stoke Mandeville Hospital referred through the City of Birmingham Children’s Department. Fifteen children were classified as able bodied, and all but two were recommended by Mr. Gene Pack of the Birmingham Parks Department. The other two children were referred by the N.S.P.C.C. The majority of these children came from large families in the Balsall Heath/ Sparkbrook area of Birmingham. None of the children would have had a holiday if they had not joined our camp. Some children suffered from myope or asthma as well as these handicaps. Two were doubly incontinent, and nocturnal enuresis was common with three children. The main plan of the camp was to integrate the physically handicapped with the able bodied, and achieve total acceptance of everyone into a consolidated group. 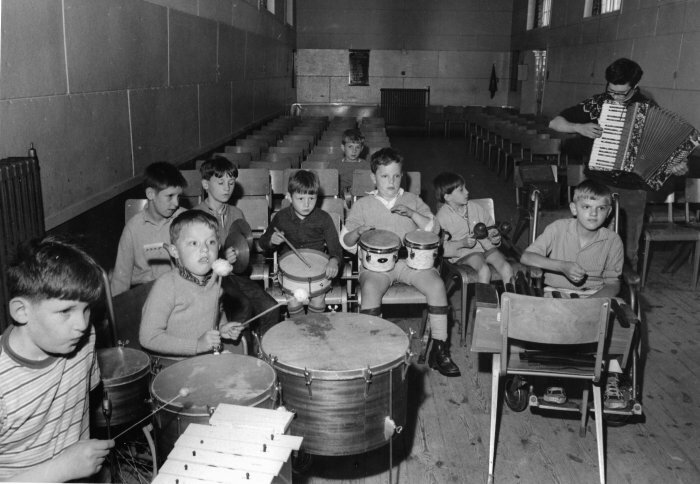 The camp was designed to take the less severely disabled who are sometimes held back at the school while at the camp they were placed amongst children who were fitter than themselves as they found themselves being continually extended. 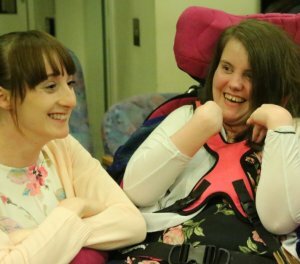 The experience for all the children of being placed in a new environment away from home enabled them to achieve independence and self assurance that they would not have otherwise have gained. It was considered that the particular age group of 8-12 was very suitable for the carrying out of the integration of the one group with the other. It was intended to take all the above propositions and see how successful the camp was in achieving the necessary objectives, and how they could be better achieved by any alterations in methods, since the camp was designed basically as an experiment. A basic programme for the ten days of the actual camp was worked out. Two whole days were to be spent out of the camp, one at Christchurch on a boating trip, and another day at Beaulieu on a visit to the Montagu Motor Museum. The remaining eight days were planned so that most of them would be taken up by a programme that would be fairly regularised. However, the programme was designed to be flexible enough to be altered if ideas for improvement emerged while at the camp, and indeed the details of the camp programme were deliberately not worked out until we had actually assembled most of the key volunteers at the camp. The daily programme was organised so that breakfast was at 8.30 a.m. (volunteers rising at 7.15 a.m., children at 7.30) for an hour and a half after breakfast the children were divided up into three groups of art, music or drama, at the beginning of the holiday they had decided which group they would like to go in for and within reason they remained in these groups so that something could be produced by each group at the end of the holiday on the open-day that was planned. After a break at 11 a.m. the children either went swimming, took part in archery, played table tennis or billiards, etc. Lunch was at 1 p.m. and after a rest period of forty minutes, a period of activities were planned which varied with specific days. 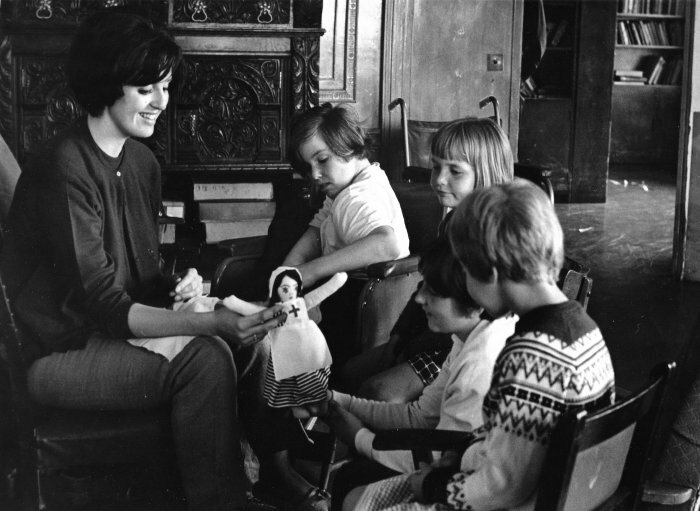 On several days tea outings for parties of twelve children to ladies living locally were arranged. Those were a great success, and were much enjoyed by everyone. We also arranged a shopping trip to Alton, pony riding, a trip for all the children to the local fete at Bentley, a treasure hunt, and other such activities. Tea was at 4 p.m. and after that, except for those who were out on other activities, more games, swimming, etc., were organised. Supper was at 6.30 p.m. with varying activities organised afterwards (e.g. barbecues, parties, football, magician entertainment, etc). 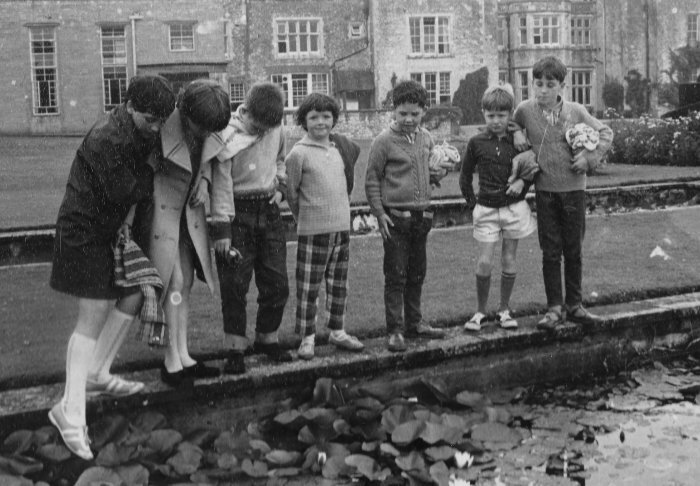 There was considerable free time for children to play amongst themselves, as this was felt to be most important. Bedtime was at 8.30 p.m approximately, with lights out at 9.l5p.m. The camp was without doubt a success, and this was due to a number of favourable circumstances. One reason was the fact that we had a friendly group of well adjusted children but also a crucial factor was the adaptability and initiative of the volunteer staff. Another factor was the Lord Mayor Treloar College, which was almost ideal in situation and layout. The main object of the camp which was to integrate all the children, was successfully achieved apart from a few exceptions. Two of the deaf children, although apparently enjoying themselves thoroughly, did not mix well with the other children on the other hand another child, who was also deaf, was one of our most successful protègeàs, making many friends, and making a great deal of progress in communication, One girl was taken home after a week, since her parents insisted on ringing her up every evening at least once and often twice, with the consequence that she was homesick and unsettled the other children, and consumed an unfair proportion of the staff’s time. Our spina bifida boy was rather a difficult case, and did not mix well with the other children. On the other hand all these children benefited enormously from the holiday. Our outstanding successes amongst the physically handicapped children were the two brothers who had muscular dystrophy, and the little girl with spina bifida. One boy with asthma arrived apparently hating the rest of the world, and left far more mature, and yet full of fun and goodwill, far more happy, and with many friends. However, every volunteer would quote different cases as being the most outstanding. All the less handicapped children benefited enormously from being with physically more able children. All the more severely handicapped children benefited by finding many able bodied friends, and by finding out how successful they could he in different activities, and learning to accept their disabilities which affected them in other activities in a philosophical way. The able bodied children were kind and considerate in dealing with the physically handicapped, and learnt to accept them and their restrictions without question. They learnt a certain amount of unselfishness, how to live with others, and became far more independent and mature away from home. There is no doubt that they all enjoyed themselves tremendously. Everyone, including the staff, felt that the camp was an outstanding success, making it an unforgettable experience. None of the volunteers at the camp have any doubt at all that every single child benefited in some way, and that all the objectives of the camp were achieved. None of them have any doubts also about the value of this work and the fact that it must continue, and that this is necessarily only a beginning. We hope to maintain contact with the children through parties and other activities which will absorb the limited funds that are still available. So far as next year is concerned the exact nature of the camp is as yet undecided, but we hope to continue on much the same line as this year. A committee has been formed under the chairmanship of Mr I.G. Mitchell, Headmaster of Wilson Stuart school, and plans are already in progress for future camps. We hope to put emphasis on continued Physically Handicapped and Able Bodied activities throughout the year with special efforts to get more able bodied involved.